Many species of fruit-eating birds eat the succulent fruits of strangler figs. The indigestible seeds are then voided by the birds and will germinate in a tree crevice or hole. The young fig starts its life as an epiphyte in the canopy unlike other tree seedlings that have to start their struggle for survival on the forest floor. It grows slowly at first, for there is little water or food for it, but its leathery leaves reduce water loss. The plant puts out long cable-like roots that descend down the host tree trunk to the forest floor and root into the soil beneath. It can then readily absorb nutrients and water and the young fig tree flourishes. The thin roots become thicker and interlace their way tightly around the supporting tree trunk. The expanding leafy crown of the strangler starts to shade the crown of the support tree and its roots start to strangle its host. The host tree slowly rots away leaving a totally independent strangler fig which may live for several hundred years or more. The most famous of all individual fig trees in the Wet Tropics are the 'Curtain' and 'Cathedral' figs, in the Atherton Tablelands. A bird, possum, tree kangaroo or rat drops a strangler fig seed in the top of a tree. The seed gets covered with leaf mould and grows. The roots of the seed grow down the side of the host tree until they reach the ground. The initial roots take root in the ground, while more and more grow down the sides of the tree to the ground. The roots eventually totally enclose the host tree and the host dies. The tree that remains is totally the strangler fig. 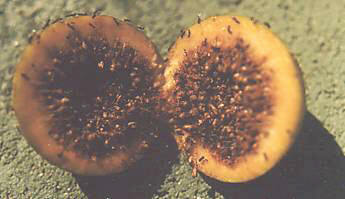 One of there most famous ecological relationships is that between their flowers and fig wasps. These tiny flowers of each particular species of fig are pollinated only by another particular species of 'fig wasp' (family Agaonidae). 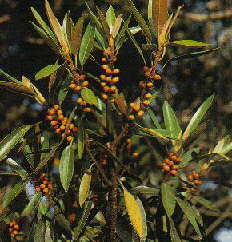 The plant relies on the wasps for pollination, while the wasps rely on the 'fruit' to reproduce within. Because of this relationship, it is thought figs have to provide these fruit receptacles more or less continuously, and thus many figs fruit asynchronously. That is, trees fruit out of sync with other individuals of the same species.